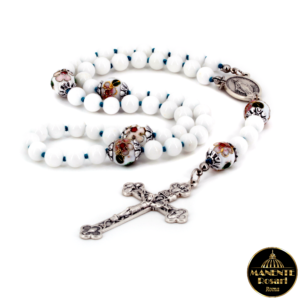 MANENTE Rosaries is an Italian small family business specialized in designing and creating handmade rosaries, catholic rosaries, sterling silver rosary necklaces, Swarovski crystal rosaries which are completely handcrafted and unique. The great accuracy and attention to details, the rigorous selection of materials and the accurate check, ensure long duration and elegant beauty of our products. Each rosary is created with love, unhurriedly, with special care and attention; this is why their availability is limited. There are three goals as we hand make our rosaries: they must be beautiful, “easy” to pray with and durable. Nevertheless, we have to admit that although very resistant, our rosaries are not unbreakable. All their components, if not properly treated, could break. That is why they need to be used in a proper way, considering that they are not appropriate for infants and small children because small parts could be ingested or inhaled by accident. It takes longer to choose materials than to design and create our rosaries. We personally buy our natural stones beads from our trusted suppliers, choosing every time only the best quality. The same happens with each component used to create our rosaries. It’s obvious that this extensive work of choosing materials needs a lot of time and dedication, but at the same time it ensures a higher quality of all our rosaries. Such a policy, implies some disadvantages, though. It often happens that a supplier has very limited quantity of materials which directly affects the availability of our rosaries: sometimes, in order to replicate specific models, waiting for material arrivals, it might take weeks, or months. On one side this might mean a limitation, but on the other side it represents a guarantee of uncompromising quality. Here at MANENTE Rosaries we do not follow a commercial policy. Of course the financial aspect is important for a business, but it is not our priority. Our main goal is to create rosaries of high quality and beauty for the purpose of sacred prayer and meditation of the most Holy Rosary. The rosary is an instrument of prayer, but it is also a “sign” of Faith. Undoubtedly we could pray with a plastic rosary that you can buy for a low cost. Nevertheless it is also true that it is absolutely fair to desire and to use an instrument of prayer – precisely a rosary – that in its own beauty and value symbolizes what is for us the place taken by the rosary prayer in our daily lives. If we go back to the days, when St. Francis, the Poor Man of Assisi blessed our earth by his faith, we see how even he, in his authentic vow of poverty, desired to have a beautiful and decorative prayer book. This was a holy man who did not consider it a necessary thing to change his old cloak or his short robe. This special prayer book is now held by the Sisters of the Order of St. Clare in the crypt of the proto-monastery of St. Clare – made of handwritten parchment paper. It was a text that certainly requested, in order to be produced, more abilities and competences of those needed to build a cathedral. It goes without saying that such a prayer book had a high value, not only spiritual, but also economic. It is obviously impressive thinking that such an object was wanted and possessed by a man devoted to the highest poverty, by a man who did not even get new clothes to replace his own tattered rags (cf. Giovanni Marcotullio, Ci vorrebbe un Breviarium, https://giovannimarcotullio.com/2017/02/14/ci-vorrebbe-un-breviarium/, 14/02/2017). We want to follow the very same reasoning with regard to the rosaries. We like to think that they, in their unicity and beauty, represent the very same high value represented, in our life, by the daily prayer of the Holy Rosary. To us, a Holy Rosary is not only an object of devotion, but is much more an act of love to our Heavenly Mother. One last thing, since its establishment we want to consecrate our business – MANENTE Rosaries – to the Immaculate Heart of Mary and to the Chaste Heart of St. Joseph. 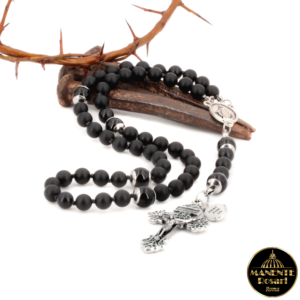 May they guide us in our business, and may they bless and accompany all those who will receive one of our rosaries.